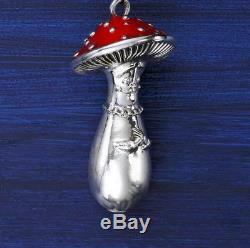 Mihail Chemiakin & Mihail Sasonko Original Christmas Toy "Mushroom". The weight: 0.1 kg. Dimensions: 3.0 x 8.0 cm. One of the most striking, though not speaking of "The Nutcracker" characters - Christmas tree. Target series of memorable, haunting, guessable "Shemyakinsky" images embodied in the ballet in the form of Christmas tree decorations. Material: Tin Alloy, tempera, acrylic. Number of copies: in order to order. This sculpture belongs to a series of characters of the ballet "The Nutcracker" staged at the Mariinsky Theater in the scenery and costumes of the artist. The task of the new production of "The Nutcracker" (Mariinsky Theater, 2001) - to return to the spirit of the tale is true Hoffman with his grotesque humor, strange and mystical transformation. All this is reflected in characters modeled by Mihail Shemyakin in tin. The item "Mihail Chemiakin & Mihail Sasonko Christmas Toy Mushroom Silver Plate" is in sale since Wednesday, December 06, 2017. This item is in the category "Collectibles\Holiday & Seasonal\Christmas\ Current (1991-Now)\Figures\Other Curr. The seller is "chemiakin_foundation" and is located in Saint Petersburg. This item can be shipped worldwide.